A Look at The Walking Dead #131: “A Journey Begins” | What Else is on Now? 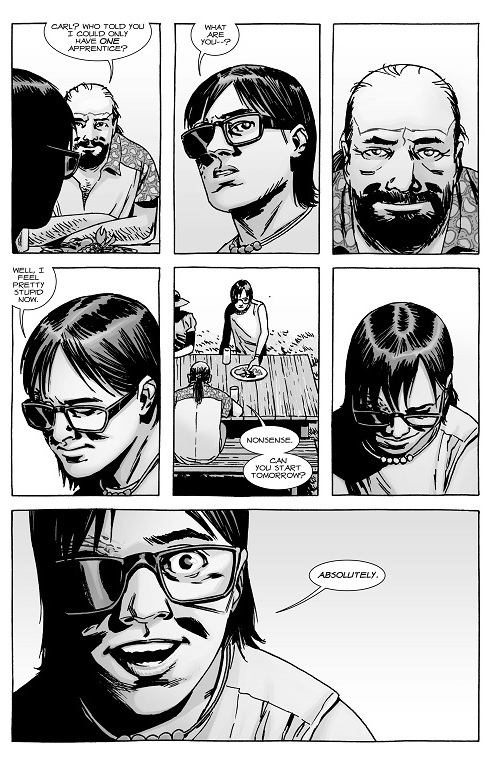 Robert Kirkman has a way of teasing you, then taking it all away, doesn’t he? 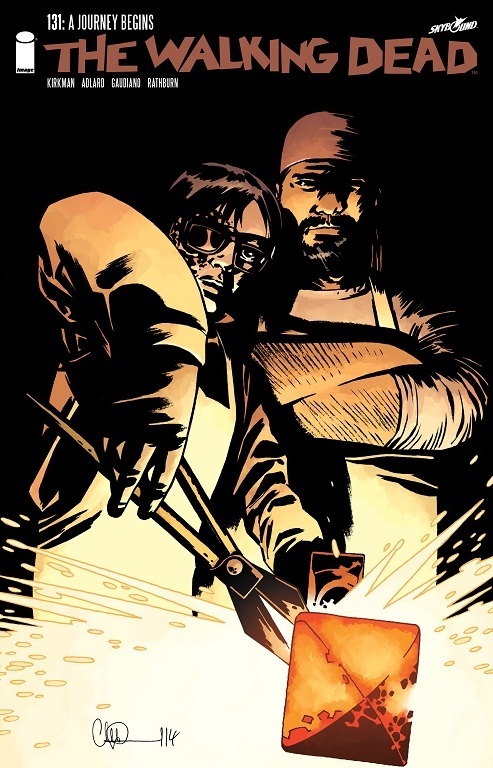 Issue #131 of The Walking Dead poses more questions and less resolution, but it does have some good moments of character development and quieter moments where the people try to live out some semblance of a normal life. Like Magna and her survivors finding Negan, I didn’t expect Marco’s revelation last time about the roamers talking to be discounted as quickly as it was. Here, it’s condensed down to ‘We’ll talk about this later.’ There’s a chance Marco may be delusional, but then there’d be no need to even have the scene of him hearing roamers talking, even if it was a dream. It could have easily been something he just imagined. And given all of the crazy things that everyone has seen since the apocalypse broke out, it’s not too out of place that something strange would happen involving the roamers’ evolution. 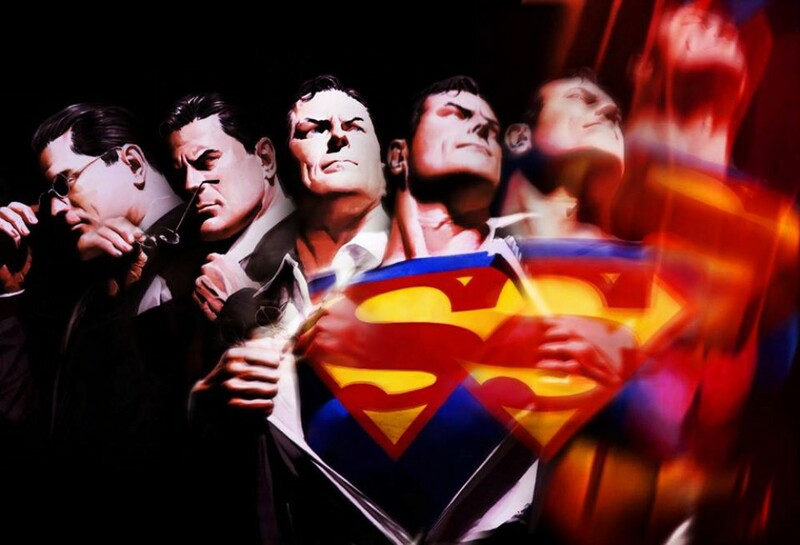 But then, I’m just speculating and not a comic book writer. Sophia! This time-skip has definitely done wonders for her and I’m glad she’s turned into such a badass after everything she’s been through. 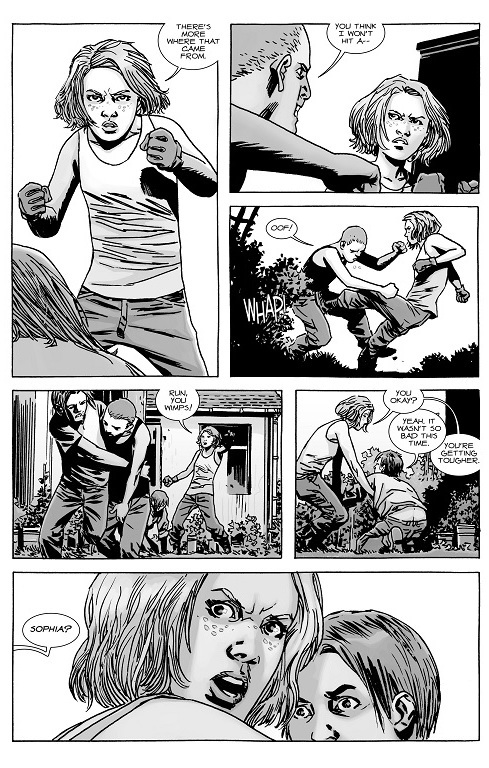 She has matured and lays the smack down on some bullies, but the instant she and Carl reunite, she turns back into the timid little girl- after she accidentally punched him, anyway- that we’ve known her as since Alexandria and prior. Given their separation, her reaction feels natural, but she doesn’t shed her badass attitude completely. It’s clear, given her reaction to Carl moving to the Hilltop, that there’s still a potential romantic spark between the two, but whether that happens may come after we learn about Carl’s letter. Hopefully it’s not a “Dear John” note. Onto Carl- what a quick change of pace he’s been through. Now that he’s become an apprentice, having him become depressed at the idea of losing it now feels like forced drama in hindsight. He was still in his funk for a bit, but once he learned that he could be the second apprentice, all that moody behavior went away in an instant. To give him something to do, maybe don’t make him the second apprentice yet, but have him meet up with Sophia and spend time with her. All the while, keep the apprentice storyline in the background and let it be resolved later while Carl adjusts to his new home. I’m very pleased how much Maggie has developed into a strong leader. She’s come into her own and it’s good to see her take charge of the townspeople. But she’s not overbearing or just showing flashes of anger for the sake of drama, the way Rick sometimes did and still does. Given what happened to Glenn, it’s clear that Maggie still remembers the past, but she won’t hold onto it and let it eat away at her. 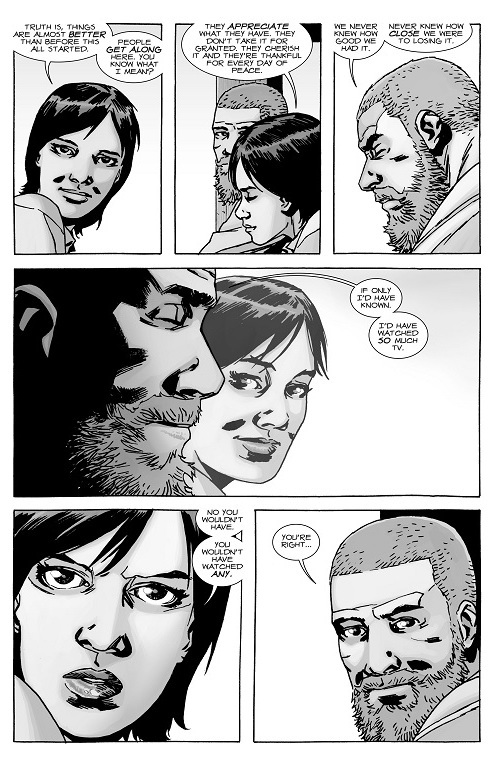 Like the last issue, we’re seeing how the Hilltop residents adjust to normal life. These aren’t the most engaging of scenes, but they’re important because they show how the people are trying to reclaim their humanity. 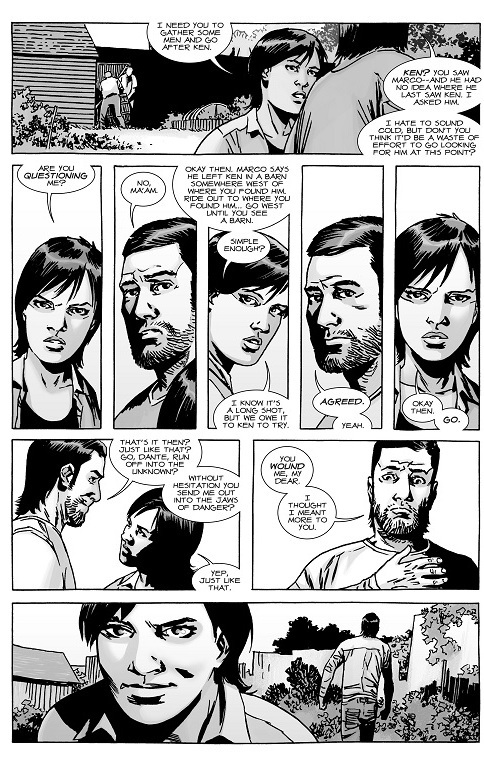 Rick and Maggie’s conversation was one of the highlights of the issue for me. These two have a deep respect for one another and their bond remains strong, despite being leaders of two different groups. First off, it’s very foreboding of Rick to wonder aloud if the dark days are behind them. Fat chance, Rick. These people have never been that lucky and at least Maggie called him out on that. But their talk went deeper than that, with Maggie saying that this life could be preferable to life before the apocalypse. She says that people get along and don’t take each other for granted. They enjoy being around one another, which says a lot, given that most of these people were strangers to one another. We never know how good we really have something until it’s gone. In a twisted sort of way, humanity may have turned out for the better- as far as these people go- because they cherish what they have. And then we got our Michonne tease. What happened to her? No idea, but Kirkman is teasing us. And we got some follow up on Eugene and Rosita, but more will come on that later. 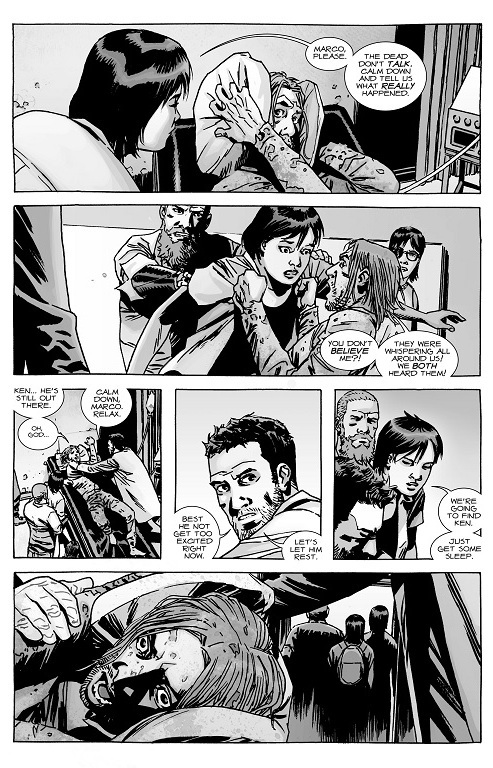 As for the final scene, it’s a little forward of Magna’s crew to just ambush Andrea, even after they didn’t buy Negan’s sob story. This won’t go over well with anyone. Sure, they haven’t fully trusted Rick, but they’re jumping the gun and ruining a good chance at maintaining bonds by ambushing Andrea. But this is Andrea and she can easily hold her own. We’ll see. This entry was posted in The Walking Dead and tagged Andrea, Carl Grimes, Charlie Adlard, Cliff Rathburn, Dr. Eugene Porter, Dwight, Heath, Jesus, Maggie Greene, Magna, Michonne, Negan, Rick Grimes, roamers, Robert Kirkman, Rosita, Sophia, Stefano Gaudiano, survivors, The Hilltop, The Sanctuary, The Saviors, The Walking Dead, zombies by omarid513. Bookmark the permalink.